Why would Prospero open a boozer in his uncharted island? To host a variety show, of course. 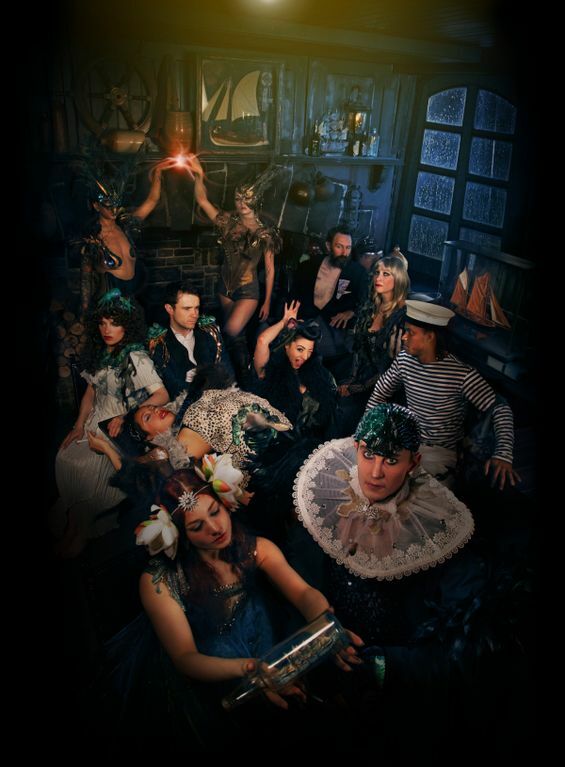 Dusty Limits writes and directs Boom Boom Club: Prospero’s Tavern, an ambitious mix of cabaret, circus, burlesque and theatre. C.J. Lazaretti interviews the rakish libertine on his latest stint behind the scenes. Shakespeare is a slightly bigger and more sacred cow than your typical targets, like Natalie Imbruglia. Nervous? Not really. Shakespeare’s infinite variety lends itself to all sorts of reinterpretations. We’re not trying to produce Shakespeare either, just using him as a jumping-off point. I’d be very surprised if it bothered Shakespeare purists. It’s a zeitgeist thing. Danny Boyle was reportedly inspired by the play in his plans for the Olympic opening ceremony. That got us thinking, and the premise emerged quite naturally. The show imagines what would have happened if Prospero had stayed on his island and opened a pub. So it’s fairly tangential to Shakespeare. What can audiences expect of the show? A lot of great performances, terrific music and an absurd amount of fun. We have the fabulous Jonny Woo as our Prospero and the remarkable Katharine Arnold as Ariel. Our core cast includes Phil Kay, Sarah-Louise Young, So and So Circus, Up and Over It, Lucky Franco and Kitty Bang Bang. Other guests will pop in and out on various dates: Meow Meow, Lady Carol, Nina Conti, David Armand, Frisky, EastEnd Cabaret, Tumble Circus, Holly Penfield, Julie Atlas Muz and others. You curated a range of performers recently in your seasons of discontent. Did you have any input into the line-up of Prospero’s Tavern? Yes. The programming of the show was done by me, David Harris and Bioux Hayes, my long-term Boom Boom co-conspirators. Who else is collaborating with you on the project? Tom Mansi and his band Uberkaboom are playing all the accompaniment live and providing the music for the post-show parties (in eight out of the 12 dates). We have a great technical crew covering lighting design, costuming (supervised by Vicky Butterfly) and innovative set design by Bryony Rumble. Kitty Bang Bang is in charge of the choreography. How does Prospero’s Tavern compare to your previous writing projects, like the annual pantomimes at the Battersea Barge? This one involved a good deal less actual writing. I came up with ideas for characters and their stories – sketches, really. The “script” consists mainly of Prospero’s banter linking those stories. I wrote a rough draft, and then worked with Jonny Woo to produce something in his voice, fleshed out by his contributions and ideas. It’s a lovely way to work. Jonny is a brilliant ad-libber as well, so the final performance may not bear much relation to my original text. Is the pen mightier than the microphone? I’d like to divide my time between the two. I’ve written and directed a number of projects over the last few years and it’s rekindled my love of directing. I want to specialise in cabaret that communicates a narrative – something more than just a series of acts strung together. I have about three major project ideas that I’ll be starting on in the autumn. And what would those be? Let’s keep them a secret. I don’t want anyone to nick my ideas. One is based on Greek tragedy, and one is based on a very camp film from the 40s. That’s all I’ll say. Like your other solo outings, the “discontent” shows have strong ideological overtones, if not downright political statements. Is that a part of Prospero’s Tavern as well? Not especially. We wanted this project to celebrate and subvert Shakespeare at the same time. High art and low art colliding, but giving the audience a great night out, with cabaret and dancing. There isn’t much overt political content in this show. It’s madcap and cheeky, more than anything. Speaking of ideological overtones, were you under any constraints to censor or tone down your writing of a show for the Priceless London Wonderground, a festival sponsored by a major credit card company? Not at all. It hasn’t even come up. Boom Boom Club is producing a show in Edinburgh. Is it a version of Prospero’s Tavern? No. Boom Boom in Edinburgh is a late night fringe show featuring promenade and installation performance as well as “The World’s Smallest Cabaret”. I’ll be hosting that with guests on constant rotation, live music and DJs. It will be more like the Old Vic Tunnels events from last December: a party with performance, taking up the entire top floor of Underbelly on Cowgate. It runs for 18 nights from August 7th. Speaking of Edinburgh, what else will you be up to in August? I’m doing a solo show called Dusty Limits: Post-Mortem at the Counting House ballroom from August 2nd to the 19th. It’s a kind of musical obituary: a greatest hits gig with songs from each of my previous solo projects, and then a handful of brand-new ones. It’s part of the Laughing Horse Free Festival, because I feel that’s where the real Fringe spirit is now to be found. London’s cabaret scene is ripe with supper clubs and multi-act revues. What’s so special about the Boom Boom Club? Boom Boom Club’s sensibility makes it stand out. It’s down-and-dirty, raucous and experimental. Over the last few years we’ve tried to keep our eyes on the horizon and produce events that are edgy, but accessible and affordable. Not exactly avant-garde, but not too commercial either. Cabaret is intimate performance in which an artist communicates directly with their audience. Plus booze. Booze is crucial. Want to grab a pint in the boozer at the end of the world? 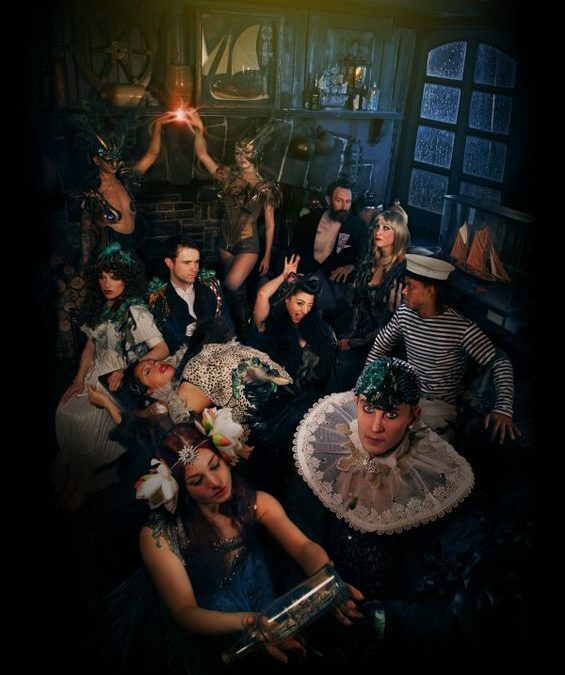 Boom Boom Club: Prospero’s Tavern plays at the Priceless London Wonderground spiegeltent on June 16th and 30th; July 13th, 19th, 28th-31st and August 1st-4th. See boomboomclub.co.uk for tickets and details.